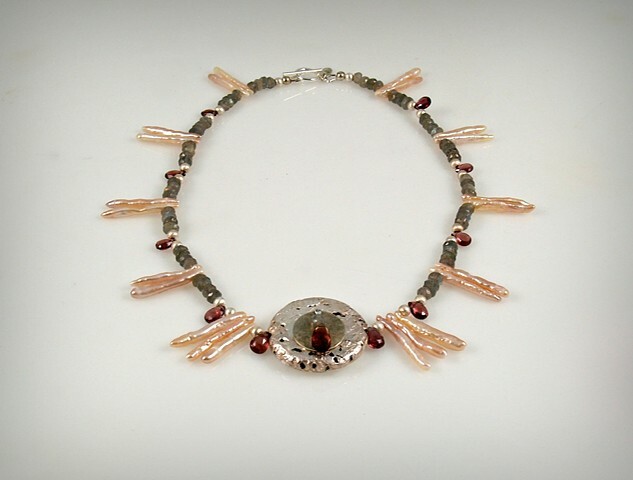 My "Sherbet and Ice" necklace is fantastically unique, and is one of my one-of-a-kind designs. I have hand-gilded silver leaf on lava, adding gorgeous tear drop faceted sapphires, freshwater pearls, labradorite beads, hand-hammered silver with dangling labradorite and sapphire on the center stone. The choker length necklace is finished with a sterling silver toggle clasp along with my artist signature tag. Beautifully unique for any special occasion!